The fourth generation Apple TV went on sale Friday morning, finally giving Apple’s set-top box the ability to play video games. It’s no gaming revolution, but it’s off to a pretty good start. I’ve been an Apple TV owner for a couple years now, but when I say owner I mean it in the strictest sense of the term—I possess an Apple TV. It’s in a drawer somewhere, the sluggish box long since replaced with an Amazon Fire TV and modern gaming consoles. I purchased the unit in case Apple ever decided to enable games on it. As of my last move the company hadn’t, and so it never got unpacked. To be fair, Apple’s presentation only glossed briefly over gaming, showing a couple of so-so games and relegating anything more exciting to brief glimpses in flavor reels. Judging by the content available at launch, I’d say the company just really didn’t have much to show. Don’t get me wrong—there are some pretty great games available. It just feels limited on my end because out of the nearly 1,000 games I’ve amassed since the original iPhone started selling them, only 18 or so were immediately available for download and play on the Apple TV on day one. Those expecting their entire gaming app library to suddenly pop up on their television will be disappointed. The app selection is pretty limited, as are ways to browse. Gaming is limited to a handful of categories on the Apple TV’s App Store page, and from what I can see there is no way to view a list of all apps in a single category. Searching for nothing brings up 100 game results, but many of those are cheap fluffery. Many more games are on the way to Apple TV in the coming weeks as developers play catch up with the platform’s release. As long as they take the time to ensure their titles work well with the Apple TV Siri Remote, I’m fine with the delay. A game’s success or failure on Apple TV will depend on how well it plays with this future couch debris right here. A Bluetooth gamepad can be connected to the system, but this is how Apple’s engineer’s envisioned people playing. I can tell how comfortable developers are with the device the moment I start playing a game. The folks behind Ubisoft’s Rayman Adventures get the Siri Remote, using the matte black touch pad surface for changing direction and attacking, while clicking the underlying button handles jumping. It’s pretty much the perfect Apple TV game. Gameloft’s racer Asphalt 8 takes advantage of the Siri Remote’s motion control capabilities quite nicely, mimicking the mobile version’s tilt controls. Then there are titles like Atypical Games’ Battle Supremacy: Evolution, which tries to cram a full gamepad’s worth of controls onto the Siri Remote, resulting in frustration. Developers need to take their time and get this right, especially when the average price for a premium game is between $4.99 and $9.99 (at least until Square Enix shows up). When a game and controller come together perfectly on the Apple TV the experience is quite satisfying. I’m looking forward to seeing more new (and old) games popping up in the App Store on a regular basis. Until then, here’s a short list of can’t go wrong titles for the new platform. Mind you this list comes from just the games I have played—I’ve yet to experience how the $9.99 mobile version of the outstanding Transistor handles with the Siri Remote, and I am not spending another $10 on Geometry Wars 3, for example. Ubisoft’s streak of gorgeous Rayman mobile games extends to Apple’s big-screen device. Rayman’s Adventure is packed with gorgeous visuals, whimsical music and incredibly smooth animation. No wonder Apple’s showcasing the game on day one. You have to get a taste of those motion controls somehow, and what better way than the eight installment of Gameloft’s consistently excellent racing series? One of my favorite iPad/iPhone games is now one of my favorite Apple TV titles. It’s an objective-based endless skiing game with lovely stark visuals and lush sound that’s so much better coming out of my entertainment center’s sound system than a tinny mobile speaker. Those colorful blocky graphics look even better on a big screen television, plus the new version allows a friend on an iPhone or iPad to play along. Multiplayer inane joy is twice the inane joy. Apple’s 2013 iPad game of the year is immensely playable no matter which controller your holding. Frogmind’s gorgeous floating platformer makes my television look incredibly good. It’s a short list, but five is plenty to get new owner’s started before they start venturing into less sure gaming waters. It’s a slow start for the Apple TV’s gaming career, but there’s a lot of promise here. 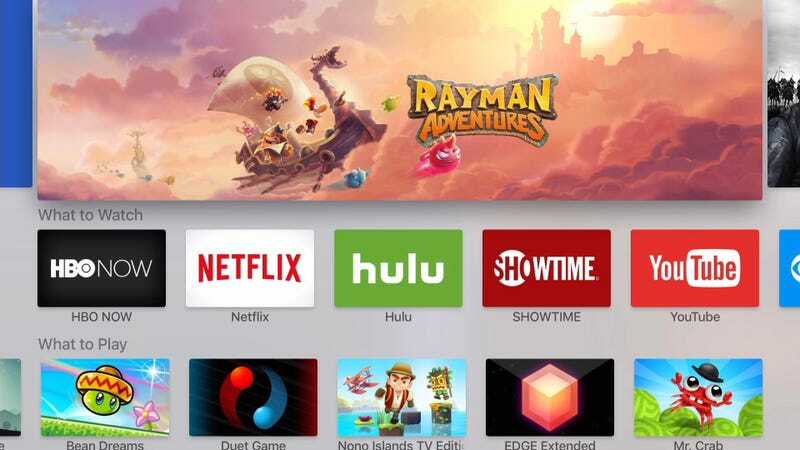 I wouldn’t recommend it as a dedicated gaming machine just yet, but for those seeking a silky smooth smart TV box with interactive entertainment capabilities I’d definitely recommend it. To contact the author of this post, Mega Fahey X, write to fahey@kotaku.com or find him on Twitter @bunnyspatial.